The South of Scotland is a natural paradise with a huge variety of landscapes to enjoy. 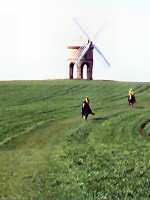 There is a great choice of riding routes and trails including hundreds of miles of rights of way for horses. One of the first of its kind in Scotland is the Buccleuch Country Ride, offering a 3-4 day ride through stunning Scottish Borders scenery. Routes in Dumfries & Galloway are less well know but well worth a visit. The Galloway Forest Park offers some of southwest Scotland’s most dramatic scenery and horses can be taken on most Forestry Commission tracks.